Considering that markets today are characterized by high levels of competition and dynamism, the managerial function is becoming increasingly complex. Managers need to develop a series of skills to be able to respond to these changes in the environment. These competences must cover a broad spectrum: (1) at the strategic level, analyzing opportunities, threats, and the strengths and weaknesses of the organization in order to ensure its survival; (2) at the group or collective level, managing people who work inside and outside the company, and (3) individually, the manager must be in control of him/herself before being able to manage those in his/her charge. Thus, proactivity, creativity, team management, and stress or time management are just some of those skills that managers should not ignore. 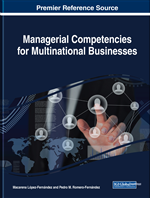 This chapter focuses on analyzing the competences that managers must develop in order to be successful in both domestic and international markets. The context in which organizations carry out their activity has been transformed profoundly and at an accelerated pace. Changes such as economic integration, the transnationalization of products and brands or the new international division of labor have driven organizational trends (e.g. technological advances, new structures of organization, labor and professional certifications, etc.) where the traditional way of operating in business is no longer effective. As a result of these changes, managers may be faced with a multitude of unexpected challenges for which the knowledge acquired in their academic training is not enough. The evidence shows that they need something “extra”, a series of personal and interpersonal skills that will allow them to achieve success for their business. This need for a range of managerial competences is ever more pressing in the current globalized market; a world that is changing at a frenetic pace, without a well-defined orientation or a clear sense; an era when digitalization is transforming the way we relate to one another; and, where international business plays a vital role for any company, because, increasingly, both production, operations and distribution are located in different parts of the world, and not necessarily in places we are familiar with. It is, therefore, mandatory that managers possess a set of skills that allow the company not only to survive, but also to succeed in the complex international environment. The aim of this chapter is not to make an exhaustive list of all the competences and skills that managers need to successfully meet the demands of the business world. However, it does aim to highlight those that are essential and applicable to any type of company, regardless of size and sector, and especially those that all international business managers must possess if they aspire to achieve and sustain the success of the company they manage. Distinguish between competences and managerial skills. Know what the main types of skills and managerial skills are. Understand the essential skills for the management of companies with an international focus. Undertake training and personal development to develop the knowledge, skills and personal traits that correspond to the new business context. Acquire profesional specialization in the field of management of organizations in international environments. Skill is understood as the ability, grace and dexterity that an individual has which allows them to perform an action successfully. It is a capacity, innate or acquired, which, although it may not be used in a habitual way, will lead to repeated results over time. Good examples of this would be swimming or riding a bicycle. We learn at a certain time and, even if we do not do it for a long time, we can do it again, if necessary, at any other time. Competence, however, is more general. It is the suitability to do something operative thanks to a set of attributes (Knowledge, Skills and Abilities –KSA model–) that are reflected in the form of concrete (specific actions taken in particular situations) and habitual (repeated or continuous) behaviors, which allow the results to be better predicted. Not only do you have to know how to swim, but you must also have the appropriate knowledge and practical skills to do it in the most efficient and effective way. Holmes (1992) also affirms that competences offer information about what a person is capable of doing, anticipating their future performance based on their past performance. Organizations that understand and improve the competences of people who get the best results can develop a competitive advantage. Hence, the competences serve as a compass for organizations.